Notepad Account holders are able to save all the notes from a StickyNotePages session to their Notepad Account, and load them back into any other StickyNotePages session at a later date. The Notepad Accounts page shows how many of your Notepad Accounts are currently in use, and allows you to add new Notepad Account users quickly and easily. 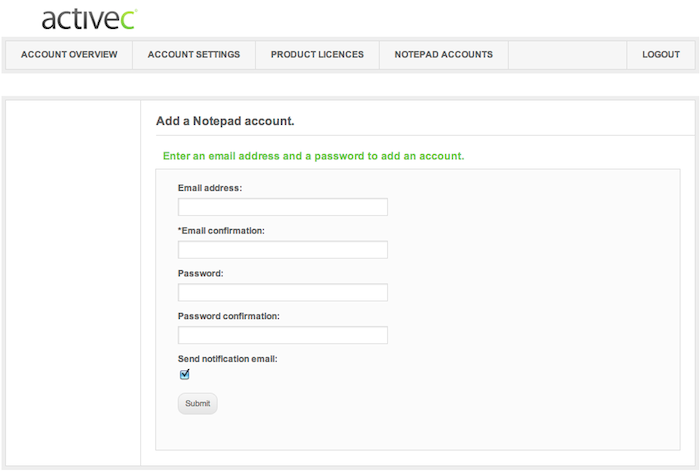 To create a notepad account for one of your team or a colleague, just enter their email address and choose a password. You can choose whether to send them an automated notification email, or to provide them with the account information yourself. Once you have created a notepad account, other options become available to help you manage those accounts for your users.